Every day, for the almost two years I worked as a staff librarian at the Suffolk County House of Correction at South Bay, the pattern was the same: Seconds after they were released from their units, inmates would not walk, they would run — as though catapulted — towards the prison’s library. Many inmates, especially those in a hurry, arrived with some specific order of business. They would grab a book of case law, or they’d check out a newspaper or magazine and take a seat at the library’s long table. They might disappear into the labyrinth of bookshelves. Many would line up to speak with me. They’d pose legal questions, talk about their families and health concerns, describe their spiritual and educational quests. Time and resources were short, and the needs were urgent. The library was a site of activity, of perpetual motion. 19th century, when prison chronicler Enoch Cobb Wines wrote that some government officials considered prison libraries to be “of doubtful influence.” There is a direct lineage from the 19th-century debate to a Connecticut politician’s recent proposed purge of state prison libraries based on the supposedly nefarious influence of certain “disgusting” novels. The problem with the public discussion about libraries in prison is that it’s the wrong discussion. 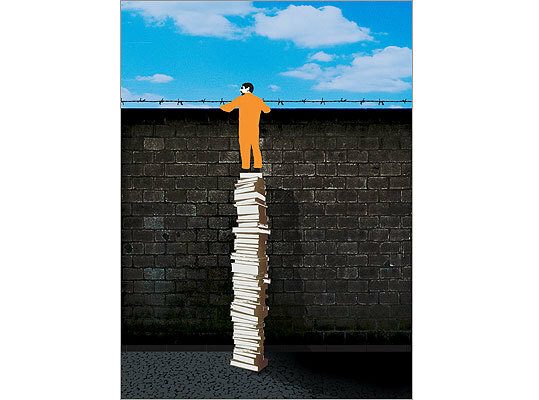 For over a century now, the debate has centered on reading — on which books should, or more often should not, be included on the prison library’s shelves; which books are “harmful” or “helpful”; whether reading is a privilege or a right. In 1867, Wines argued that a book like “Robinson Crusoe” — at the time, the only secular novel permitted in prison — served the cause of criminal rehabilitation. Others fervently disagreed. But the issue of reading is only one dimension of the question, and not necessarily the salient one. The crucial point of a prison library may not be its book catalog: The point is that it is a library. The library is a shared public space, a hub, where people spend significant portions of their time, often daily. It is a place inmates work and, in some important ways, live. It is more purposeful and educational than a recreational yard, less formal than a classroom. The prison library gives inmates an organic way to connect to the world, to each other, to themselves as citizens. It’s a small democratic institution set deep within a prison, one they can choose to join. This is no small matter. The vast majority of prison inmates will eventually be released back into the free world, back into the community. What happens to them once they are out is the critical piece of the corrections puzzle. It doesn’t take an expert to know that a person who lands in prison, a person often already on the margins of society, will grow further isolated from the norms and routines of society while in prison. And yet, at the very same time, and in this very same building, many inmates — often for the first time in their lives — are also quietly becoming enmeshed in an important social institution. There were differences, of course. There was no Internet connection. Our patrons were subject to body searches by officers, sometimes right outside the library door. Inmates came and went in tightly regimented shifts, according to their housing units, men during the day and women — who lived entirely separately — in the evenings. As a librarian, I had to stay vigilant for inmates storing or exchanging contraband. During a prison lock-down, the library would, without warning, lose its clientele. Certain books, usually oversized volumes like art books or legal tomes, would sometimes serve as ad hoc mailboxes. Inmates would write letters or brief notes and stash them in the pages for other inmates. In a world without cellphones or Facebook, this was a central form of communication — especially between men and women. What truly made the library unique, though, and what started to give me a clue to its promise, was its inhabitants. Take Fat Kat, for example. He got this nickname because he was a large fellow. But the name also revealed something more: He was a boss persona, a leader. In the prison library where I worked, he held sway. He helped run the circulation desk and fielded questions from other prisoners about the law and a variety of other topics. As the unofficial captain of the prison library inmate work detail, Kat had found his calling. Kat had about three years of prison behind him, with three more to go. He had spent his 20s involved with guns, drugs, and gangs. As it turned out, he was also an excellent and dedicated librarian. He tutored his fellow inmates in reading and math. He encouraged young inmates to pursue an education. Kat capitalized on his invaluable street cred and, in the library, reshaped himself into a new kind of role model. He was trusted by all — both inmates and staff. When he was released from prison, he found a job as a community mentor and educator, and continues this work today. Kat wasn’t the only inmate librarian. He was one of a team. As a staff librarian, part of my job was to help train, supervise, and motivate this team. The concept was simple: treat the prison library as a serious workplace. This meant treating each member with respect and, at the same time, extending them faith, with the explicit demand of seeing this faith returned. In the library, the inmates could feel respected for their labor, and more often than not, I noticed, they responded positively to the challenge and to the encouragement and were ready to give of themselves in return. The men — and in the evening, the women — who made up this work team, the inmate library detail, tended to be the more educated among the inmate population. They are exactly the kind of people who might go back into their neighborhoods and, like Kat, serve as positive role models, and even leaders. I came to realize that if we used the prison library to systematically develop these values and skills, we would be creating small, but potentially influential, cadres of post-prison citizens. If each prison library were to send even one Fat Kat back into each community, it would already have a significant effect. Of course, most inmates are not as educated, and most don’t work in the prison library. For them, the prison library offers something else. One of our regular visitors was a twentysomething woman whose 3-year-old daughter was living with a relative during her prison sentence. I’d first lured this inmate to the library by screening new release movie features. After a while, she was in the library at every opportunity, reading books and magazines and watching movies. She was, in other words, an average prison library visitor: a person who had stumbled in, almost by accident, but who ended up quietly but routinely making use of the library’s resources. When her sentence was drawing to a close, she told me that she was going to miss using the prison library. I replied with the good news: Libraries also exist outside of prison! The idea seemed to surprise her (which surprised me). In her experience, a library, as an institution, was something one encountered in prison. She’d never set foot in a library in the free world. She left prison, and the library, excited to give it a try. And, she said, she would do for her daughter what had never been done for her: She would bring the child to the public library every week. Just as a prison ID card, stamped with her mug shot, symbolized her civic isolation, I like to think of her public library card as a powerful token of membership back in society. After hundreds of hours logged in the prison’s library, the thought of using a public library now seemed not only plausible to her, but second nature. After her time in prison it was the thought of not using a library that troubled her. People tend to see a prison as a monolithic institution, a place solely dedicated to locking criminals up. But many inmates experience prison in a more dynamic way, as a clash between institutions. And what I experienced every day was that, in the collision between the institution of prison and the institution-within-the-institution, the library, something constructive and potentially long-lasting was being formed. Prison libraries aren’t miracle factories. The day-to-day was often far from inspiring. Glossy magazines and mindless movies were, for many, the main attraction. Pimp memoirs were among the most frequently requested books. And yet, even an inmate motivated by nothing more than a desire to watch “The Incredible Hulk” in the back room of the library was much more likely to come across something educational — a book, a program, a mentor — once he entered the library space. Just as important, this inmate was becoming a loyal patron of the library, something he could carry with him to the outside world, and perhaps pass on to his children. In prison, I saw inmates literally run to the library. I wondered then, as I wonder now, how much we might gain from thinking ambitiously, creatively, how to harness the energy that currently fills this little institution-within-an-institution — and find ways to cultivate it more deliberately, to direct it over the prison walls and back into the lives of our neighborhoods.